In a small bowl, combine the flour with a good pinch of salt and a bit of black pepper, then add the onion and stir until it's all well coated. Pour enough neutral oil to cover the bottom of a small saucepan. Bring it to about 190°C (it should sizzle slightly). Drop the coated onion bits in and cook for a few minutes, until the onion is golden. Remove from the oil with a spoon, place onto a few layers of kitchen towels, season with a little bit of salt and set aside. Bring some salted water to the boil, then cook the gnocchi according to packaging instructions (usually 1-2 min). Rince with cold water and drain well. Heat up a big cast iron skillet (or non-stick pan). 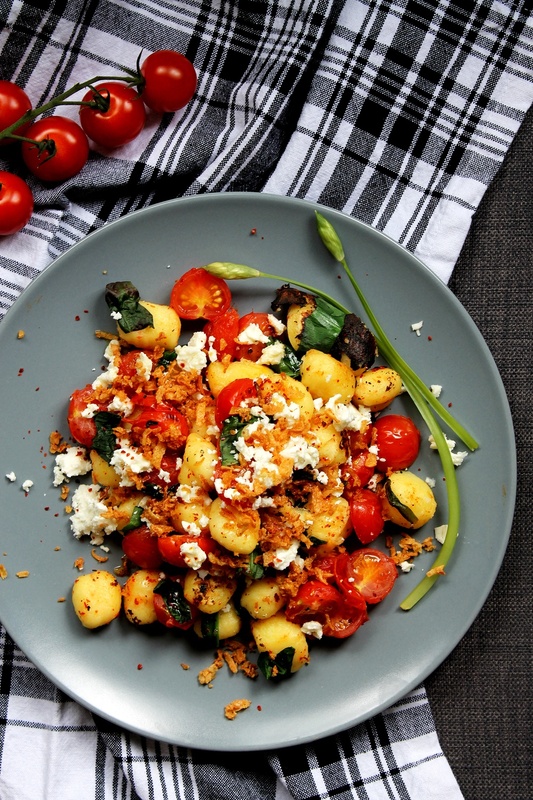 When it's hot, add in the gnocchi and the halved tomatoes. Cook for about a minute, then add 1 tbsp olive oil and the wild garlic and cook for another minute. Remove from the heat and transfer onto a plate. Crumble the feta cheese on top, sprinkle with a little pinch of salt flakes and chilli flakes to taste, drizzle with the remaining olive oil and serve immediately.